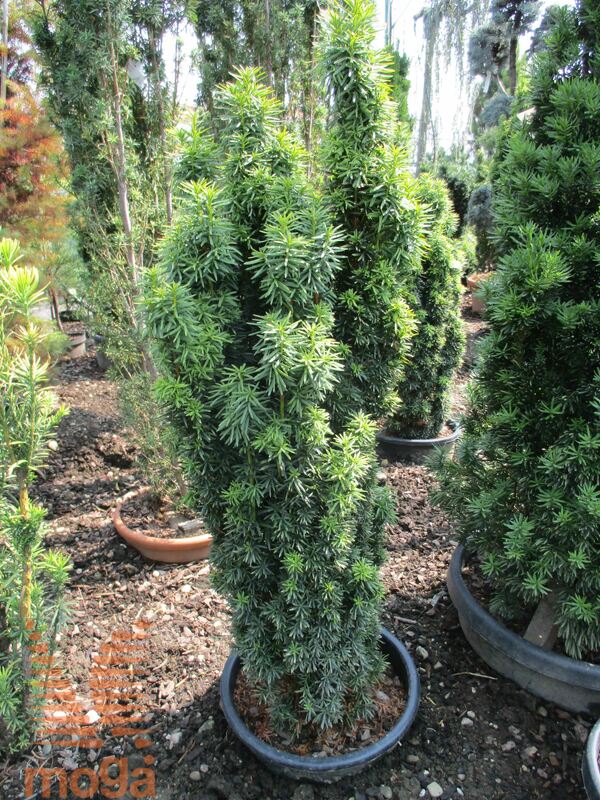 Large, upright, narrow, very slow growing evergreen shrub, conifer (H 2-2,5 m, W 0,6-0,8 m). Crown columnar to narrowly vase-shaped, dense, irregular. Bark red-brown to dark brown, flaky. Young shoots green, later red-brown. Needles thick, wide, flat (1 cm), young needles yellow to green-yellow, later dark green. Flowers unisexual, male and female flowers on separate plants; male inflorescence very numerous, yellow, female flowers green. Flowering period: March-April. Fruits ovate (0,5-0,8 cm), fleshy, juicy, light red. Ripening time: August-October. Very long-lived, healthy and adaptable species. Requires fertile, sufficiently drained, moderately moist soils. Easily withstands cold, occasional drought, wind, poor soils, urban conditions and hard pruning.